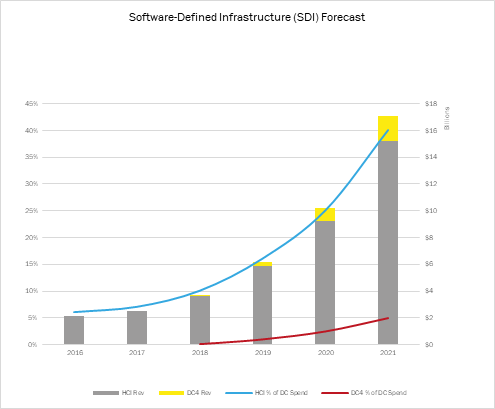 In this Insight, Neuralytix updates its quarterly forecast of the software-defined infrastructure (SDI) market. The SDI market consists of software-driven datacenters. In the Neuralytix world, we consider hyperconverged infrastructure (HCI) and composable infrastructure (aka Datacenter 4.0 or DC4). Since our last forecast at the beginning of March, 2017, Neuralytix has reevaluated our outlook for 2020 and 2021. It is our belief that we had previously been too aggressive in our assessment of both the percentage of the datacenter infrastructure market that will be HCI, along with our assessment of the total datacenter market. Previously, we had thought that the HCI portion of the total datacenter infrastructure market in 2020 and 2021 would represent 39% and 57% respectively. However, our assessment today is that the growth of HCI will be more limited, and as such, we have revised our HCI market share to 25% and 40% respectively. Neuralytix advises that interpreters of our forecast focus more on the revenue numbers than the percentage of total datacenter infrastructure. For 2018 and 2019, Neuralytix has increased the revenue associated with HCI due to our observation of the uptake by the market of these technologies, and the additional regular entrants to the market. Although we forecasted that the HCI would represent over half the market some time during 2021, we now believe that this is more likely closer to 2025. Part of the reason for stretching this out further is that datacenter infrastructure is increasingly more reliable, and the traditional 3 year refresh cycle is likely to extend closer to 5 years once HCI is introduced. As for DC4, Neuralytix has also increased slightly our revenue predictions for 2021, but reduced from 6% to 5% of the total datacenter infrastructure market. We doubled our revenue predictions for 2018 to just over $36 million, and added another 50% to 2019 to $365 million. We justify these adjustments given our conversations with both vendors, and the interest by customers that Neuralytix has witnessed in the last several months. Additionally, Neuralytix has also included more SDI that qualify (or may qualify) as DC4 in our forecasts. In particular, we have included a higher number of VxRACK FLEX sales in our forecast. It needs to be noted that the DC4 forecasts are still very preliminary, and will continue to change over the next several quarters as Neuralytix research gains further confirmation. What we have not taken into account, deliberately, are conversions from HCI to DC4. We believe that the disaggregation of HCI, and the adoption of DC4 will take place, it is way too early to predict with any degree of confidence what that might look like. In any case, any revenue associated with such conversions are likely to be subtle and immaterial for some time to come. Although we took a drastic step is revising our 2020 and 2021 numbers, readers should note that the changes had been considered for over six months; but we were waiting for sufficient evidence to present itself to us. In the last quarter, sufficient evidence finally compelled us to make the change. These revisions are not negative for the market. These are long term outlooks in a hyper fluid market with new technologies being introduced constantly.